They can't quite put their finger on it. But weather scientists know several factors are at play, disturbing the air circulation pattern over India. Circulation of air helps distribute heat over earth, thus, any change in it throws up weather surprises. This year there were many. Heat waves scorched Orissa and West Bengal in April--it usually happens in May or June. Winter rains gave a miss to the northeast. 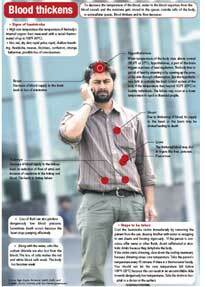 By the end of the month the heat wave was reported to have killed over 70 people in Orissa and nine in West Bengal. In Purulia in West Bengal the mercury soared to 49C on April 21, four degrees more than the average maximum for the month there (see Definition in degrees). In Orissa it touched 46C on April 20, six degrees more than the average maximum. Weathermen say a cyclonic storm called Bijli that formed in the Bay of Bengal around April 15, was responsible for the hot spell. As it moved towards Bangladesh it intersected and cut off cool easterly winds blowing from the Bay of Bengal to Orissa and West Bengal. The easterly winds keep the eastern coast cool, but in their absence north-western desert winds blowing from Rajasthan prevailed, heating the coastal states (see map). "Something similar happened last year. Temperature in Orissa shot to 45C in the last week of April. That year too a cyclonic storm in the Bay of Bengal cut off the easterlies. "Similar events in two continuous years do not establish a trend, but they do give us enough reason to investigate whether there is a pattern in cyclones cutting off easterlies and leading to heat waves," said M Rajeevan, scientist at the National Atmospheric Research Laboratory in Tirupati. Yet cyclonic storms are only a partial explanation of heat waves. Hot spells are increasing in other parts of the country as well. Last year in mid-April, maximum temperatures over south-western and central parts of India ranged between 40C and 43C, one to two degrees above normal. The number, duration and area of spread of heat waves in India increased sharply during 1991-2000 in comparison to the earlier two decades, according to a study by the India Meteorological Department or imd. The department has clubbed its observation centres into 35 subdivisions. On compiling daily data on heat wave conditions over subdivisions, the researchers found that between 1991 and 2000 an average of 22.7 subdivisions in the country were hit by heat waves per year, while between 1971 and 1980 an average of 9.9 subdivisions were hit by heat waves per year. During 1981-1990 the average was 7.3. The study, published in the April 2004 issue of imd journal Mausam, showed more areas suffered frequent heat waves in 1991-2000 compared to earlier decades. 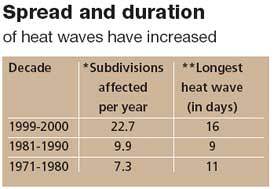 Twenty-five subdivisions went through more than 15 spells of heat waves in 1991-2000. While in the previous two decades two subdivisions recei-ved more than 15 spells of heat waves. It is the same with the duration of heat waves. During 1991-2000 the highest duration of heat waves was 16 days, while in the previous decade the longest heat wave was of nine days and a decade before that, 11 days. "Though we have not studied it thoroughly, our observation indicates the increase was steeper in this decade," said D S Pai, lead author of the study and scientist at imd in Pune. His observations were corroborated by a study by Rajeevan. It said the number of heat wave days per year in central and north-west India increased from three to 12 between 1969 and 2005. But we are yet to find the reason behind the increase. One reason could be different parts of the earth warming at different rates; it is likely to bring frequent changes in air circulation, said Rajeevan (see 'Rain Shocked', Down to Earth, March 1-15, 2009). And the different rate of heating could be due to both local factors and global warming, said Pai. 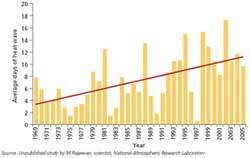 The decade 1991-2000, during which the frequency of heat waves increased sharply, was the warmest in the past 140 years. Pai explained that an anticyclone is prevailing over India, with its centre hovering around Rajasthan and a little north of it. Anticyclones are centres of high pressure from where winds blow out in every direction. The anticyclone over India sends warm winds from north-west to central and western India, causing heat waves. "Since the winds are warmer than earlier, heat waves are more intense," Pai added. Scientists say the anticyclone was also partially responsible for heat waves on the eastern coast of India. "Even though Bijli cut off the cool easterlies, the heat wave would not have been this intense if there was no anticyclonic wind pattern prevailing over India," said A K Srivastava, another scientist at imd in Pune. So the anticyclone over India and the cyclonic storm over the Bay of Bengal together led to heat waves. But why did heat waves come so early? They are--or were--rare in April. Rajeevan offers an explanation "The cyclone may have developed in April because of early rise of temperature which also heated the sea." Meteorological data of the past one hundred years shows March and April are warming faster than May and June, which are the hottest summer months. The average temperature for March has increased by 0.76C over the last century; that for April has increased by 0.58C; and in both May and June the increase has been 0.17C. Most of this increase has taken place over the last three decades, said Srivastava. A study published in Current Science in 2007 said the increase was sharper in north India than in the south. "In north-west part of the country and northern Maharashtra, temperatures in the first fortnight of April have risen significantly in the past one hundred years. It is more than the rest of the country but we have to make some more calculations before coming to any conclusion about the exact rise," Srivastava said. Preliminary calculations by D R Pattanaik, scientist at imd in Delhi, show that in coastal Andhra Pradesh, May temperatures in the past decade have risen significantly, while temperatures in June have dropped somewhat. But in Assam, temperatures from February to June have risen similarly (see graphs). Pattanaik said any conclusion about summer setting in early required station-wise analysis of imd data as against the subdivision data he had analysed. 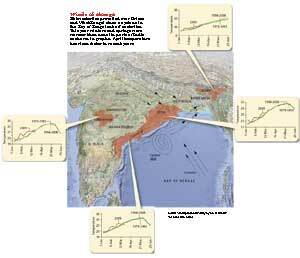 The April heat wave in eastern India was preceded by a long dry spell in the northeast. A wind called western disturbance that brings moisture from the Mediterranean Sea, moves from the west to the east of the country, causing winter rains. Assam receives an average of 25 mm rainfall per month in winter. But this year there was negligible rainfall between November and February. In March, Assam experienced four severe dust storms. Some scientists have attributed the abnormally dry winters to lesser number of western disturbances reaching the region. Rajendra Hathwar, additional director general at imd Pune, explained this year most of the western disturbances had a more northerly track. The winds showered rains over Jammu and Kashmir but even Himachal Pradesh, Uttarakhand, Punjab and adjoining states had deficient rainfall this winter. They touched Arunachal Pradesh to some extent and should have affected Assam in end February and March, but did not. Srivastava said this may be due to abnormal heating of the Tibetan plateau. The plateau was warmer than normal by two degrees this February, added Pattanaik. When a plateau heats up winds over it move horizontally, unlike upwards in the plains. This creates a high pressure over the plateau, which then shoves away winds. "So the western disturbance avoided the plateau and flowed north of it," he said. But scientists have not studied whether this is a regular phenomenon. "There is no study on this aspect," said Rajeevan. According to Hathwar, another source of rains in the northeast in November is the cyclones that sometimes form over the Bay of Bengal and move towards West Bengal or Bangladesh. After shedding the first showers there, they cause good rainfall over northeastern states. In November last year it did not happen. Srivastava said lack of winter cyclones is not a trend. "Tropical cyclones in the peak cyclone months of May and November have increased, while those occurring in the rest of the year have decreased," he added. So now we have more intense rainfall (see 'Rain shocked', Down To Earth, March 1-15, 2009), more heat waves and sudden dry periods taking us unawares. While scientists struggle with data to find out how much more could come upon us, the changes are taking place faster than they can predict.